University of Hyderabad MBA Admission 2018 will be done on the basis of CAT 2017 conducted by IIM. The application process for the academic session 2018-19 has started and the last date for application is 15 December 2017. School of Management Studies (SMS) under University of Hyderabad offers the two years full-time MBA Programme for the academic year 2018-19. University of Hyderabad MBA Admission will be based on the composite score of CAT 2017 and Group Discussion and Personal Interview (GDPI). The candidates willing to take admission into MBA Programme in the University of Hyderabad needs to fill a separate Registration Form. The candidates should have completed their Bachelor’s Degree of minimum 3 years with minimum 60% in any discipline recognized by UGC/ AICTE on or before June 2018. The candidates completing their final examination by June 2018 can also apply. Candidates should appear in CAT 2017 to be held on 26 November 2017. University of Hyderabad Online Application Form is available now and the candidates can fill the application form through online mode. The candidates should fill and submit the application form on or before the due date i.e. 15 December 2017. Registration: The candidates need to follow the link given above which will redirect the candidates to the official website. Fill the application form: The candidates have to fill in the application form by filling in Personal and Academic details. The candidates must enter their CAT Registration Number and Test Code along with the Registration Fees on or before 15 December 2017. Upload Photograph and Signature: The candidates have to upload the photograph which would be of 50 KB jpg and signature 20 KB in a digital format. Payment of Application fees: At last, the candidates need to make the payment of Application Fees will only be made Online using SBI iCollect Online Payment. The Candidates cannot make payment through any other mode. The candidates before making the payment of the application fee and submitting the form should check the details filled by them are correct in all aspect. The candidates need to submit the duly filled in University of Hyderabad Application Form Online only. However, they are advised to take a print-out of the Online Application Form for future use only. Application Fees for Hyderabad are different as per the categories. The candidates belonging to the respective categories must pay their application fee accordingly. The fee has to be paid through online mode only that is Credit Card/ Debit Card/ Net Banking. University of Hyderabad MBA Admission 2018 will be based on CAT scores and the Group Discussion and Interview at the University Campus. The shortlisted candidates will be notified for GDPI at the month of February 2018. GDPI will be held in February/ March 2018 for the shortlisted candidates and they need to attend the University campus at their own cost. Commencement of classes will be in the month of July 2018. Note: IIMs has no role in the selection process of Univerity of Hyderabad MBA Admission. Financial Support to the blind candidates: The visually blind candidates are provided financial support from UGC. UGC provides Reader's allowance Rs.1000 per month in respect of PG/M.Phil/P.h.D. students and Rs. 1500 for JRF and Rs. 2000 for SRF holders for the employment of a Reader. An annual grant of Rs. 500 for guide charges, extra time of 20/30 minutes for writing the 2/3hoursofexamination paper. The students are given permission to use a personal typewriter during examinations. In addition to this, the blind students are given scribe charges of Rs 150 for Internal Exams/Term papers and Rs. 300 for end semester examinations. Special stationary charges of Rs. 500 per annum and guide charges of Rs. 500. Post-Graduate Merit Scholarship Scheme for University rank Holders at Undergraduate Level: UGC on the basis of a recent initiative of MHRD, has introduced the PostGraduate Merit Scholarship for University Rank Holders (in General and Honours courses at University levels). The selection will be purely on merit basis. The value of each scholarship is Rs.2000 per month and duration is for 2 years. Post-Graduate Indira Gandhi Scholarship Scheme for single girl child: The University Grants Commission, on the basis of a recent initiative of MHRD, has introduced the PostGraduate Indira Gandhi Scholarship for Single Girl Child as an incentive for the parents to observe small family norms. The value of each scholarship is Rs.2000 per month and duration is for 2 years. A.P.Govt. Scholarships for the children of deceased Govt. servants who died while in service. A.P.Govt. Scholarships and book grant to children of political sufferers. University of Hyderabad Placement Cell facilitates Placement for the students. The faculty Coordinator facilitates the Placement of the students. 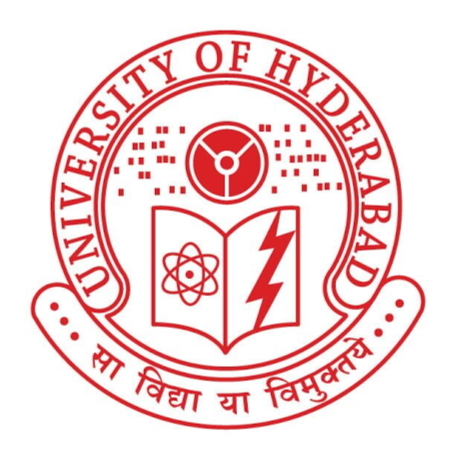 The students of the University of Hyderabad has been placed in the reputed organisations across sectors. Placement Guidance and Advisory Bureau (PGAB): The Placement has been Strengthened by the University's Placement Guidance and Advisory Bureau (PGAB).